This is a free public event for patients, public, and family and friend caregivers to learn about and use health research to inform your health choices. The event includes a light dinner, informative presentations and a talk show-style conversation. The evening will be capped with a talk show-style conversation with three guests: a patient, a clinician and an academic. 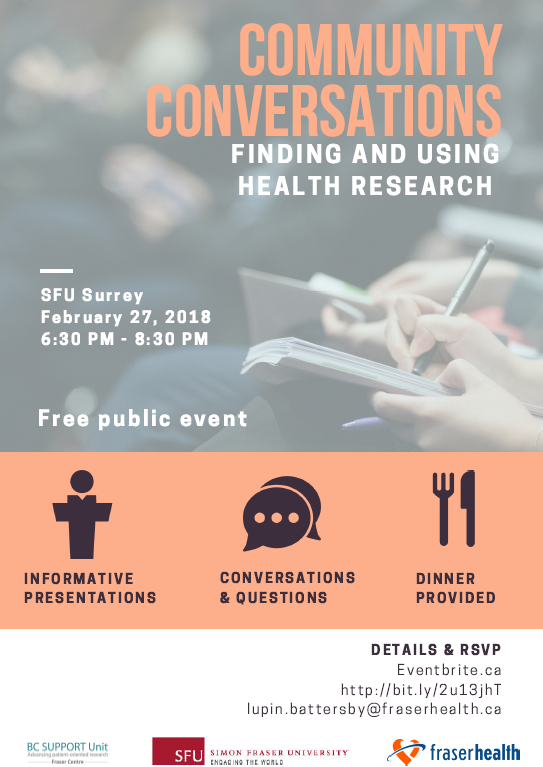 The conversation will explore challenges, opportunities and tips for finding and using health research with lots of time for audience questions. Check-in and food starts at 6:00 p.m. Presentations start at 6:30 p.m. Please click here to RSVP for this free event for catering purposes.